Thanks to a friend’s American Author Reading Challenge (read at least one book by a specific author in each month of 2014), I finally tackled this classic novel that has been on my shelves forever. It’s hard for me to understand how I didn’t know much about it beyond the fact that the main character was named Billy Pilgrim and the bombing of Dresden in World War II featured prominently, but so it goes. It was a surprise and a delight to discover the way Vonnegut used farcical situations and humor to illuminate some deadly serious events. It is just an illusion we have here on Earth that one moment follows another one, like beads on a string, and that once a moment is gone it is gone forever. When a Tralfamadorian sees a corpse, all he thinks is that the dead person is in bad condition in that particular moment, but that the same person is just fine in plenty of other moments. Now, when I myself hear that somebody is dead, I simply shrug and say what the Tralfamadorians say about dead people, which is ‘So it goes.’. It’s easy to see how such a philosophy might comfort a man who has seen unimaginable death and destruction, in the war and back home in upstate New York. Americans, like human beings everywhere, believe many things that are obviously untrue, the monograph went on. Their most destructive truth is that it is very easy for any American to make money. They will not acknowledge how in fact hard money is to come by, and therefore, those who have no money blame and blame and blame themselves. This inward blame has been a treasure for the rich and powerful, who have had to do less for their poor, publicly and privately, than any other ruling class since, say, Napoleonic times. This young-adult trilogy is set on the planet New World, where settlers from Old World (presumably Earth) headed looking for a new start after ruining their original home. The initial landing went badly, resulting in a native species of intelligent beings (known as the Spackle) being slaughtered and then subdued as slaves, all the men being infected with a virus that makes every inner thought audible to everyone (the Noise), and all the women being killed in one of the original settlements, Prentisstown. Out of Prentisstown comes Todd, a young teen who is forced to flee when the mayor, who is plotting a war to take over the planet, turns against him. He soon meets up with young Viola, a girl who crash-landed with a scout ship from an incoming group of new settlers. Todd and Viola travel across the planet to try to warn the incoming settlers before Mayor Prentiss can start his war. Along the way, they encounter other settlers from other towns, including a renowned woman healer who sets herself up as the leader of an armed resistance to now-President Prentiss. I thought this trilogy (plus The New World, the very slight short story that showcases Viola’s life on the scout ship just before it lands) was really well done. The writing is certainly on a young-adult level (sensible since all three novels are narrated in turns by Todd and Viola), but the themes that it tackles are far from simplistic: What is war? Is it ever OK to kill someone? Do the ends ever justify the means? Is it possible to do the wrong thing for the right reasons? Is redemption ever really possible? Time and again I braced myself for a pat answer, and time and again I was pleasantly surprised. Ness takes pains to present the good and bad sides of both heroes and villains, to the point where readers will find themselves questioning which is which. Partway through the series, I expressed the opinion that this is a better YA trilogy than The Hunger Games. After finishing the third book, I stand by that opinion. While I enjoyed both series quite a bit, I think Ness does a better job of presenting and exploring the larger themes that lie behind the narrative. Amanda Foreman has written a magnificent history of the role played by Britain (and less intensely, other European countries such as France) in the American Civil War. It’s an aspect of American history not often touched on in more general histories of the Civil War era, making Foreman’s book an essential addition to any Civil War or American history library. It is only a small exaggeration to say that Britain’s crucial role was to play no role at all. The British government, both in London and in the consulate in Washington, D.C., worked very hard indeed to maintain its neutrality. It had to work so hard because both North and South were desperate to claim the support of the former mother country. Confederate leaders were sure that the Union blockade keeping Southern cotton from reaching British textile mills would create an economic crisis that would force Britain to declare its support for the Confederacy. On the other side, President Lincoln and his cabinet were sure that Britain’s abhorrence of slavery would lead it to declare its support for the Union cause. Such confidence was shaken when they realized that few in Britain believed that the war was being fought to abolish slavery — a belief upheld by the reluctance of Lincoln first to enact and then to enforce the Emancipation Proclamation. An overzealous naval blockade that repeatedly entangled British merchant ships in its web did little to garner Union support either in the halls of Parliament or the streets of Britain. Although the official British position remained studiously neutral throughout the conflict, Foreman also undertakes to explore the lives of a number of British citizens who took it upon themselves to come to the United States to fight, some for the Union but many more for the Confederacy. Many of these individual soldiers found themselves taking on rather more than they bargained for in their “grand adventure”, and British diplomats were often helpless to extract them from their misadventures. A World on Fire is painstakingly researched and well written in a style accessible to more than an academic audience. Make no mistake, it is a tome of epic proportions — more than 1,000 pages. In reading, I couldn’t help feeling that the book could have been significantly shortened without detriment to its main thesis by abbreviating or eliminating some of the detailed shot-by-shot battle recreations. There is a plethora of Civil War books that delve exhaustively into military strategy; the extent to which Foreman does the same seems superfluous to the main thread of the story. Despite that minor quibble, I would highly recommend this book to anyone with an interest in either the Civil War era or the history of British-American relations. Foreman’s scholarship seems impeccable, and her narrative is engaging and thoughtful. 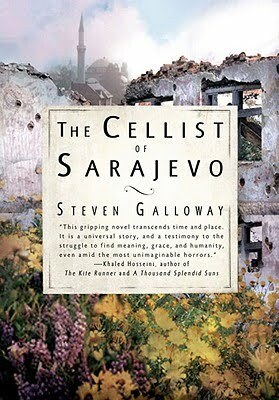 It took me much too long to review The Cellist of Sarajevo, but not because I couldn’t decide whether I liked it or not. I knew as soon as I started reading this compelling and unusual narrative of the effects of the 1997 siege of Sarajevo on a quartet of the city’s citizens that it was one of the finest books I’ve read in a long time. No, the delay was because as soon as I finished it, I started loaning it out to people who I was pretty sure would love it, too. One of them, Amir, lived in Sarajevo when the siege began. He managed to escape through the tunnel mentioned in the book, and later married a good friend of mine and came to the U.S. But enough about that. The narrative of The Cellist of Sarajevo is unusually constructed. There are four main characters, and the chapters alternate between their viewpoints. One of the characters is the titular cellist, who reacts to a bombing that killed 22 people waiting in a bread line by vowing to play on the bombing site every day for 22 days. Another character is “Arrow,” a female sniper who is assigned to protect the cellist from assassination during his daily concerts. Kenan must make a dangerous trek across the city to fetch fresh water for his family, a journey that involves crossing intersections that are targeted by enemy snipers in the hills surrounding Sarajevo. Dragan is making a similar journey, trying to reach his workplace where he knows he can get a free meal — a precious commodity in a city where privation is the norm and no one has enough. The four characters never meet each other, but they encounter other neighbors, friends, and strangers during the course of their quests. These encounters bring into sharp focus what it means to retain your essential humanity in the most inhumane of conditions, and whether it is possible to live through a war without losing the eseential essence of civilization. It’s important to note, I think, that while The Cellist of Sarajevo is based on actual events, the author says in his introduction that he has compressed three years of war into a month of narrative for literary purposes. Knowing that did not lessen the impact of the story for me in any way. The Cellist of Sarajevo is beautifully, lyrically written. I found myself compelled to read passages to myself, for the joy of hearing the language spoken aloud. Reading aloud also helped to slow my reading, and prolonged the pure pleasure of the experience of living with these four brave, fascinating individuals.